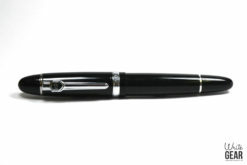 This pen is great for beginners and enthusiasts alike, with a smooth and wet nib, and an exciting visual style. 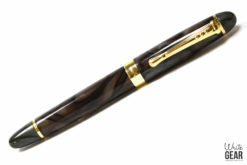 It is a two-tone gold and silver nib, which beautifully matches the accents on the pen. The pen has an elegant shape, and is also comfortably heavy. 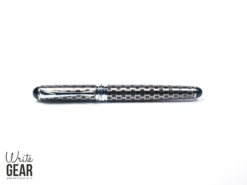 The clip features attractive detail, as well as being nice and tight. The cap simply pulls off, making this a great pen to pull out of your coat for a quick note. Holding the X450 is very comfortable, as it has a triangular grip section. Another great feature of the X450 is that it ships with a converter. This means it is ready to be used with bottled ink straight away. Diamine inks pair with these pens really well, and we have plenty of colours available. 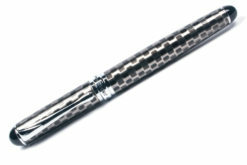 Additionally, if you prefer cartridges to bottled ink, this pen is compatible with International Standard cartridges. 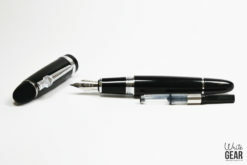 This means it will fit cartridges made by Diamine, Kaweco, J. Herbin, Pelikan, Montegrappa, and many others.